Albert Jack is a internationally bestselling author who has been successfully tackling some of the great World Mysteries for over twenty years. Using Occam's Razor he manages to shave away the theories, the improbable and the hysteria, hype and sensational to reveal only the known, probable facts. From what's left, he argues, the truth of everything can be found, despite how unlikely it seems in s… ome cases. 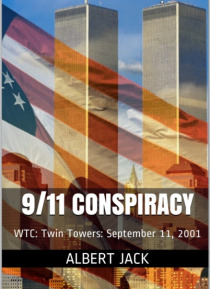 In 9/11 Conspiracy Jack ignores all the conspiracy theories and lazers in on only the known details, however deeply hidden they have become since that awful, tragic day.If you want to know who is really responsible then you need to read 9/11 Conspiracy. You may be in for a few surprises but will be left in no doubt, in the end, as to what really happened on that day.-----------IntroductionThe events that took place on September 11, 2001 were the most important of our generation. Possibly the most important of our lifetimes and certainly the since the bombing of Pearl Harbour and the Second World War. But they will definitely not be the Crime of the Century. There is much more to come, although hopefully not in my lifetime.For over a decade we have been told on every news program, every radio bulletin, in speeches, statements & announcements, front page stories, magazine articles, Government policy announcements and by every government official throughout the West; that the world has changed. And we have to react with it.We are told that 9/11 has changed the course of our domestic and foreign policy. (It certainly has) Our civil liberties must be amended with the changing times. Those responsible and their allies must be hunted down and punished, however loosely connected they are, regardless of the cost, either in human or financial measure.The event must not be forgotten. It should dominate debate, both public and private. We must reconfigure, adapt, refocus, reprioritise and come together as one, with our allies, to defend our freedoms and liberties. And we should do everything we can to make sure it never happens again. And that means we must rely on the elected policy makers, who are advised by experts with minds immeasurably greater than ours. And then do as we are told and pay for it.Some of this, of course, is true. We do face a great threat from Islam and some of its followers. Well, millions of its followers actually. Let there be no misunderstanding here that some of them intend to destroy us. They love death more than we love life and they will keep coming at us. Wave after wave, generation after generation and each finding new and darker ways of reaching us. We must accept that if the good guys are becoming more and more clever, and advanced, in their ways of protecting us, then the dark side is moving just as cleverly in the other direction.And never was this more obvious (at the time) than on the morning of September 11, 2001. It was a statement of intent. This is how much respect we have for you. This is how much we hate you. It was so extraordinary that we have to wonder what on earth we have done, by way of Foreign Policy since the Second World War, to make them hate us that much. ?The obvious way to try and understand this is to begin with an investigation of the 9/11 attacks and try to find out how a bearded caveman was able to strike at the heart of the world's military superpower. Really, how does a projectile manage to hit the Pentagon in Washington DC? How can that even happen, never mind New York for the moment. How do Fred Flintstone and Barney Rubble manage to pull that off?So find out who was responsible and why...?